Kaju Katli or Kaju Barfi (cashew fudge) is a most sought after indian sweet at home. whenever we get a big box of kaju katli at home, they just get over in a couple of days. If you stay in north india then during the all most festival you might receive a box of kaju katli or dry fruits as a gift. kaju katli is one of the most popular sweets which is gifted to relatives and friends during the festival in north india. Powder the cashew in a coffee grinder or a dry grinder. The cashews should be in powdered form and not become pasty or oily. On a low flame heat sugar and water in a thick bottomed or non stick pan or kadai. Meanwhile grease a plate or a tray and keep aside or keep butter papers ready. When all the sugar dissolved in the water, add the cashew powder. there is no consistency in the sugar syrup required like one string or two string. just let the sugar dissolve in the water and then proceed with the next step. Stir and keep on stirring the cashew mixture on a low flame. The cashew mixture would start thickening. Cook the cashew mixture for approx 7-9 minutes till the whole mixture starts to come together. Remove the whole lump of the mixture from the pan and place it on work surface, bowl or plate. Add the rose petals and ghee or oil to the cashew mixture. Flatten the dough and place it on a butter paper or on a greased plate/thali or tray. Place a butter paper on top and then using a rolling pin, roll gently the dough from all sides till you reach a thickness of 3-5 mm in the dough. Remove the butter paper and let the rolled cashew dough cool. 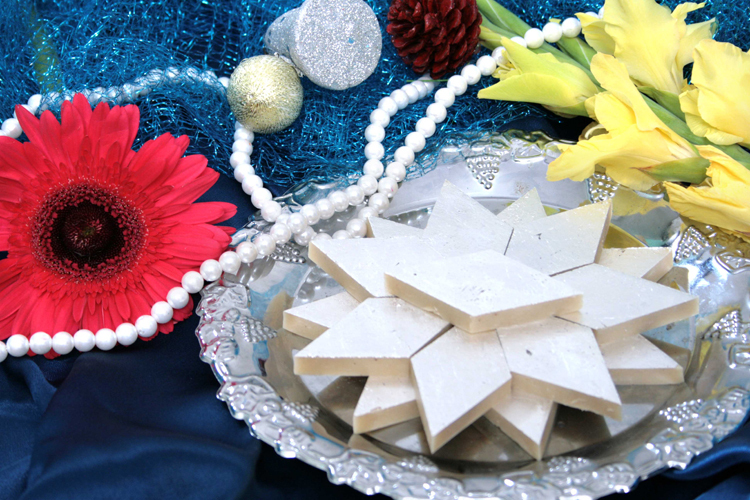 When completely cooled, using a sharp knife cut the cashew dough giving square or diamond shapes. If using saffron, then roast them first in a dry pan and then coarsely powder them in a mortar-pestle. add the powdered saffron in the cashew dough. If using rose water, then add it to the sugar and water solution.